I hope you are having as much fun as I am. All these projects are definitely getting me in a festive mood and I hope you are inspired to do some projects of your own. For all of you digital designers out there, here is a treat for you. An original digital stamp for all your layouts or cards. All you need to do is download it to your computer (PNG file) and use it! All of the traditional scrappers, please do not despair. You can use this stamp in traditional scrapbooking as well. Copy the image to your computer and print it. You can print it on a nice piece of paper, mat it and embellish it. You can also cut it and adhere to any project you want. Day 8 Mission: (if you choose to accept it) is to share your favorite holiday project. It can be a layout, a card, mini album, home décor, whatever project you like the most. Post it on your blog, on FB, on message boards, anywhere on line you want with a link to the Blog Party. Then go back to my blog and write a comment with a link to your post. Day 7 giveaway: today's winner will get Prima Essentials Floral Embellishments. 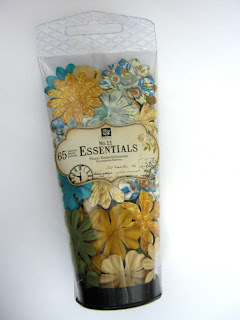 65 beautiful flowers for all your projects. כבר הזכרתי כמה אני נהנית במסיבה שלך?! רעיונות נהדרים בכל יום מחדש! ממש עושה לי חשק שיגיע כבר חג!